COLUMBUS, Ohio -- Although only separated by five miles, Briggs and Grove City seem worlds apart. Coming together on the hardwood on Wednesday, the two southwest side programs tussled for 32 minutes in a hard fought game that Grove City came out victorious in, 50-43. Briggs had the early advantage, nearly leading by double digits after holding Grove City to five points in the first quarter. While the Greyhounds couldn't seem to make a shot in the opening eight minutes, they began to heat up in the second quarter. Junior forward Cole Crager scored nine points in the second quarter alone, helping the Greyhounds close to a 22-21 deficit at the break. Briggs received big production from sophomore forward Javion Williams, who nearly notched a double-double in the first half, as the 6-foot-4 forward controlled the glass and finished tough inside. Battling in the third quarter, Briggs began to gain some momentum as junior guard Domenic Farley knocked down two threes, helping the Bruins gain some momentum. Grove City was not denied though, as sophomore guard Brock Waits woke up after a tough first half showing. Outscoring Briggs 16-15 in the third quarter, Grove City entered the final frame tied at 37. While Briggs took an early lead at 41-39 with six minutes to go, the Bruins quickly gave up a 7-0 run in the ensuing moments. Topped off by a Waits three and tough mid-range score from Crager, Grove City took a 46-41 lead with 2:27 remaining, as Briggs' three-point shooting quickly went cold at the worst time. Holding on in the final two minutes, Grove City improved to 3-0 on the season while Briggs dropped its first game of the year. The Greyhounds were led by Crager, who finished with 15 points. The 6-foot-3 junior was a tough cover all night, knocking down two triples and finishing a few contested shots from mid-range and in. Waits added 13 points, 11 of which after halftime, as he quickly got back into the rhythm that he's been in to start the year. Sophomore guard Alex Coffey had a solid showing, adding eight points on two three-point field goals in the first half. Senior guard Bubs Morrison, who is coming off one of the best weekends of his life after hitting the game-winning three to beat Bexley on Saturday, added five points, six rebounds and three assists, the majority of which after halftime. For Briggs, Williams was the Bruins' top performer, finishing with 15 points and 12 rebounds. We'll have more on Williams below. In his first game back from a torn ACL that ended his sophomore season, junior forward Jacob Cash turned in a productive showing off the bench, finishing with 12 points, seven rebounds and three blocks. No other player scored more than six points for Briggs, who really struggled to make shots from the perimeter. 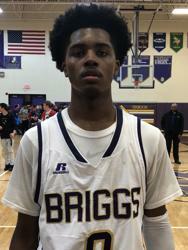 Javion Williams (6'4 WF / Briggs / 2021): After hearing a lot about Williams this offseason, it was refreshing to get our first look at the 6-foot-4 sophomore on Wednesday. With a wiry frame and great length, Williams made an impact instantly, snatching rebounds and scoring on the interior. Williams has great hands, is an above-average athlete and competes on both ends of the floor. Finishing with a double-double against a young, but tough Grove City squad, Williams showed flashes of the high-level upside that he has. Williams is the best prospect that Briggs has had since Rodney Willis in 2015 and should be a player that this program builds around for years to come. Knocking down five-of-seven attempts from the line, Williams showed a soft shooting touch, while rebounding like a grown man, snatching everything in and around his area. With a lineup full of non-seniors, Briggs has a bright future and it will all center around the 6-foot-4 Williams. The x-factor of this team, look for Williams, who is an agile and fluid athlete, to be a breakout player in the City League. Cole Crager (6'3 WF / Grove City / 2020): Crager provides Grove City with toughness that the Greyhounds greatly rely on, as he made the type of shots and defensive plays to bring home the win. Scoring 15 points, Crager did it by hitting two threes, knocking down a few contested mid-range jumpers and finishing inside when given the chance. Crager competes on both ends, is a physical athlete that can move guys around and has the foot speed to defend on the perimeter at the high school level. As Grove City graduates several key contributors from last year's team, Crager will be an important piece for this team moving forward, as continued performances like Wednesday's will help put this team in a position to compete in the OCC. 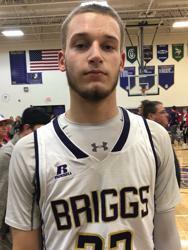 Jacob Cash (6'5 WF/PF / Briggs / 2020): While a torn ACL put an end to a promising sophomore season for Cash, the 6-foot-5 forward did not let that knock him off track, as he returned to the floor on Wednesday and had arguably the best game of his career. Providing Briggs with plenty of hustle plays on both ends, Cash finished with 12 points, seven rebounds and three blocks off the bench. Showing full confidence in his repaired knee, Cash dove on the floor for multiple loose balls, challenged shots vertically at the rim and rebounded with passion on both ends. The 6-foot-5 forward scored it everywhere from 16 feet and in, showing off a nice one-dribble pull-up jumper from the right baseline that really impressed us. With a great work ethic, motor and toughness, Cash is a long athlete that figures to keep improving. Providing Briggs with much needed confidence and stability, Cash is on the verge of a breakout junior season in the City League. Brock Waits (6'0 PG / Grove City / 2021): The son of former longtime Grove City head coach Greg Waits, Brock Waits plays with the type of toughness, confidence and overall awareness that you would expect from someone who has grown up around high school basketball. Running the show for the Greyhounds in his sophomore year, Waits has taken great strides in his overall skill set, as he made a great impact on the defensive perimeter, putting pressure on Briggs' guards and helping hold the Bruins starting backcourt to 11 total points. Waits is very quick laterally, can get by defenders to the rim and is a knockdown shooter. Scoring 11 of his 13 points after halftime, Waits played some of his best basketball in leading Grove City to a win. After seeing important minutes as a freshman, Waits is more than ready to break out as a sophomore for a young Greyhounds team that will need him to grow up quickly. Waits is in a groove right now and is the most important piece to this team on both ends of the floor. 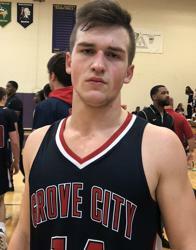 Alex Coffey (6'0 G / Grove City / 2021): A player that many did not expect to play varsity this early, Coffey has solidified his spot in the starting lineup for Grove City and is not looking back. Providing the Greyhounds with two key threes in the first half that helped get Grove City back in the game, Coffey showed the type of role he is going to have on this team as a floor spacer. Coffey is a confident shooter that moves the ball, which will feed in well with what Grove City looks to do offensively. In a lineup that features two sophomores and a junior, Coffey will be an important piece to the program moving forward as Grove City looks to remain competitive in year one of the Eric Saxton era.